More than 700 living languages are spoken in Indonesia. Most belong to the Austronesian language family, with a few Papuan languages also spoken. The official language is Indonesian (locally known as Bahasa Indonesia), a variant of Malay, which was used in the archipelago, — borrowing heavily from local languages of Indonesia such as Javanese, Sundanese, Minangkabau, etc. The Indonesian language is primarily used in commerce, administration, education and the media, but most Indonesians speak other languages, such as Javanese, as their first language. Wayang Kulit (shadow puppet) in Wayang Purwa type, depicting five Pandava, from left to right: Bhima, Arjuna, Yudhishtira, Nakula, and Sahadeva, Indonesia Museum, Jakarta. 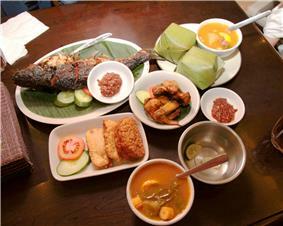 A selection of Indonesian food, including ikan bakar (roasted fish), ayam goreng (fried chicken), nasi timbel (rice wrapped in banana leaf), sambal, fried tempeh and tofu, and sayur asem. ^ "Indonesia" (Country Studies ed.). US Library of Congress. ^ "Population". www.bi.go.id (in Indonesian). ^ a b c d e f "Indonesia". International Monetary Fund. Retrieved 2 November 2014. ^ "Human Development Reports 2014". United Nations. Retrieved 25 July 2014. ^ "Poverty in Indonesia: Always with them". ; correction. ^ Guerin, G (23 May 2006). "Don't count on a Suharto accounting". Asia Times Online (Hong Kong). ^ a b Tomascik, T; Mah, JA; Nontji, A; Moosa, MK (1996). The Ecology of the Indonesian Seas – Part One. Hong Kong: Periplus Editions. ^ a b Anshory, Irfan (16 August 2004). "Asal Usul Nama Indonesia" (in Bahasa Indonesia). Pikiran Rakyat. Archived from the original on 15 December 2006. Retrieved 5 October 2006. ^ Earl, George SW (1850). "On The Leading Characteristics of the Papuan, Australian and Malay-Polynesian Nations". Journal of the Indian Archipelago and Eastern Asia (JIAEA): 119. ^ Earl, George SW (1850). "On The Leading Characteristics of the Papuan, Australian and Malay-Polynesian Nations". Journal of the Indian Archipelago and Eastern Asia (JIAEA): 254, 277–8. ^ a b Justus M van der Kroef (1951). "The Term Indonesia: Its Origin and Usage". Journal of the American Oriental Society 71 (3): 166–71. ^ Brown, Colin (2003). A short history of Indonesia: the unlikely nation?. Allen & Unwin. p. 13. ^ Choi, Kildo; Driwantoro, Dubel (2007). "Shell tool use by early members of Homo erectus in Sangiran, central Java, Indonesia: cut mark evidence". Journal of Archaeological Science 34: 48. ^ Finding showing human ancestor older than previously thought offers new insights into evolution. Terradaily.com. 5 July 2011. Retrieved 29 January 2012. ^ Pope, GG (1988). "Recent advances in far eastern paleoanthropology". Annual Review of Anthropology 17: 43–77. ^ "The Great Human Migration". Smithsonian. July 2008. p. 2. ^ Evidence of 42,000 year old deep sea fishing revealed | Archaeology News from Past Horizons. Pasthorizonspr.com. 26 November 2011. Retrieved 29 January 2012. ^ Peter Lewis (1982). "The next great empire". Futures 14 (1): 47–61. ^ Gert Oostindie and Bert Paasman (1998). "Dutch Attitudes towards Colonial Empires, Indigenous Cultures, and Slaves". Eighteenth-Century Studies 31 (3): 349–55. ^ "Indonesia: World War II and the Struggle For Independence, 1942–50; The Japanese Occupation, 1942–45". Library of Congress. 1992. ^ a b Charles Bidien (5 December 1945). "Independence the Issue". Far Eastern Survey 14 (24): 345–8. ^ "Indonesian War of Independence". Military. Global Security. Retrieved 11 December 2006. ^ Indonesia's 1969 Takeover of West Papua Not by "Free Choice". National Security Archive, Suite 701, Gelman Library, The George Washington University. ^ John Roosa and Joseph Nevins (5 November 2005). "40 Years Later: The Mass Killings in Indonesia". ^ Robert Cribb (2002). "Unresolved Problems in the Indonesian Killings of 1965–1966". Asian Survey 42 (4): 550–563. ^ John D. Legge (1968). "General Suharto's New Order". Royal Institute of International Affairs 44 (1): 40–47. ^ US National Archives, RG 59 Records of Department of State; cable no. 868, ref: Embtel 852, 5 October 1965. ^ Delhaise, Philippe F (1998). Asia in Crisis: The Implosion of the Banking and Finance Systems. Willey. p. 123. ^ "President Suharto resigns". BBC. 21 May 1998. Retrieved 12 November 2006. ^ Burr, W.; Evans, M.L. (6 December 2001). "Ford and Kissinger Gave Green Light to Indonesia's Invasion of East Timor, 1975: New Documents Detail Conversations with Suharto". National Security Archive Electronic Briefing Book No. 62. ^ Robert W. Hefner (2000). "Religious Ironies in East Timor". Religion in the News 3 (1). Retrieved 12 December 2006. ^ "Aceh rebels sign peace agreement". BBC. 15 August 2005. Retrieved 12 December 2006. ^ a b Susi Dwi Harijanti and Tim Lindsey (2006). "Indonesia: General elections test the amended Constitution and the new Constitutional Court". International Journal of Constitutional Law 4 (1): 138–150. ^ "The Carter Center 2004 Indonesia Election Report" (PDF) (Press release). ^ (2002), The fourth Amendment of 1945 Indonesia Constitution, Chapter III – The Executive Power, Art. 7. ^ a b c d "Background Note: Indonesia". U.S. Library of Congress. U.S. Department of State. Retrieved 26 November 2009. ^ a b "Country Profile: Indonesia" (PDF). ^ Wong, Kristina (23 July 2009). "abc NEWS Poll: Obama's Popularity Lifts U.S. Global Image". USA: ABC. Retrieved 23 October 2011. ^ "Indonesia – Foreign Policy". U.S. Library of Congress. U.S. Library of Congress. Retrieved 5 May 2007. ^ Chris Wilson (11 October 2001). "Indonesia and Transnational Terrorism". Foreign Affairs, Defense and Trade Group. Parliament of Australia. Retrieved 15 October 2006. ; Reyko Huang (23 May 2002). "Priority Dilemmas: U.S. – Indonesia Military Relations in the Anti Terror War". Terrorism Project. Center for Defense Information. ^ "Travel Warning: Indonesia" (Press release). US Embassy, Jakarta. 10 May 2005. Archived from the original on 11 November 2006. Retrieved 26 December 2006. ^ Chew, Amy (7 July 2002). "Indonesia military regains ground". CNN Asia. Retrieved 24 April 2007. ^ Witular, Rendi A. (19 May 2005). "Susilo Approves Additional Military Funding". The Jakarta Post. Retrieved 24 April 2007. ^ "Indonesia flashpoints: Aceh". BBC News (BBC). 29 December 2005. Retrieved 20 May 2007. ^ "Indonesia agrees Aceh peace deal". BBC News (BBC). 17 July 2005. Retrieved 20 May 2007. ; Harvey, Rachel (18 September 2005). "Indonesia starts Aceh withdrawal". BBC News (BBC). Retrieved 20 May 2007. ^ Lateline TV Current Affairs (20 April 2006). "Sidney Jones on South East Asian conflicts". TV Program transcript, Interview with South East Asia director of the International Crisis Group (Australian Broadcasting Commission (ABC)). Archived from the original on 18 September 2006. ; International Crisis Group (5 September 2006). "Papua: Answer to Frequently Asked Questions" (PDF). Update Briefing (International Crisis Group) (53): 1. Archived from the original on 18 September 2006. Retrieved 17 September 2006. ^ Michelle Ann Miller (2004). "The Nanggroe Aceh Darussalam law: a serious response to Acehnese separatism?". Asian Ethnicity 5 (3): 333–351. ^ Part of the autonomy package was the introduction of the Papuan People's Council, which was tasked with arbitration and speaking on behalf of Papuan tribal customs. However, the implementation of the autonomy measures has been criticized as half-hearted and incomplete. Dursin, Richel; Kafil Yamin (18 November 2004). "Another Fine Mess in Papua". The Jakarta Post. Retrieved 5 October 2006. ^ "Papua Chronology Confusing Signals from Jakarta". The Jakarta Post. 18 November 2004. Retrieved 5 October 2006. ^ a b c d "Indonesia". CIA. Retrieved 10 April 2011. ^ a b Witton, Patrick (2003). Indonesia. Melbourne: Lonely Planet. pp. 139, 181, 251, 435. ^ 2006"2"Population density – Persons per km. CIA world factbook. Photius Coutsoukis. 2006. Retrieved 4 October 2006. ^ a b Calder, Joshua (3 May 2006). "Most Populous Islands". World Island Information. Retrieved 26 September 2006. ^ "Republic of Indonesia". Encarta. Microsoft. 2006. Archived from the original on 31 October 2009. ^ "Volcanoes of Indonesia". Global Volcanism Program. ^ "The Human Toll". UN Office of the Special Envoy for Tsunami Recovery. United Nations. Archived from the original on 19 May 2007. Retrieved 25 March 2007. ^ "About Jakarta And Depok". University of Indonesia. University of Indonesia. Archived from the original on 4 May 2006. Retrieved 24 April 2007. ^ Brown, Lester R. (1997). State of the World 1997: A Worldwatch Institute Report on Progress Toward a Sustainable Society (14th edition). New York: W. W. Norton & Company. p. 7. ^ "Indonesia's Natural Wealth: The Right of a Nation and Her People". Islam Online. 22 May 2003. Archived from the original on 17 October 2006. Retrieved 6 October 2006. ^ "Globalis-Indonesia". Globalis, an interactive world map. Global Virtual University. Retrieved 14 May 2007. ^ Whitten, T.; Henderson, G.; Mustafa, M. (1996). The Ecology of Sulawesi. Hong Kong: Periplus Editions Ltd.
^ "Indonesia". InterKnowledge Corp. Retrieved 6 October 2006. ^ "Lambertini, A Naturalist's Guide to the Tropics, excerpt". Press.uchicago.edu. Retrieved 10 April 2011. ^ Tamindael, Otniel (17 May 2011). "Coral reef destruction spells humanitarian disaster". Antara news. Retrieved 30 May 2011. ^ a b Severin, Tim (1997). The Spice Island Voyage: In Search of Wallace. Great Britain: Abacus Travel. ^ Wallace, A.R. (2000) . The Malay Archipelago. Periplus Editions. ^ a b Jason R. Miller (30 January 1997). "Deforestation in Indonesia and the Orangutan Population". TED Case Studies. Retrieved 14 August 2007. ^ Higgins, Andrew (19 November 2009). "A climate threat, rising from the soil". The Washington Post. Retrieved 11 December 2009. ^ a b BirdLife International (2010). Leucopsar rothschildi. In: IUCN 2008. IUCN Red List of Threatened Species. Retrieved 2 December 2011. ^ Massicot, Paul. "Animal Info – Indonesia". Animal Info – Information on Endangered Mammals. Retrieved 14 August 2007. ^ Marcus Colchester, Normal Jiwan, Andiko, Martua Sirait, Asup Y. Firdaus, A. Surambo, Herbert Pane. "Promised Land Palm Oil and Land Acquisition in Indonesia: Implication for Local Communities and Indigenous People". Retrieved 26 March 2012. ^ "Economy of Indonesia". State.gov. 3 November 2010. Retrieved 10 April 2011. ^ "What is the G-20". G-20. Archived from the original on 4 May 2011. Retrieved 6 October 2009. ^ "Report for Selected Countries and Subjects". Imf.org. 14 September 2006. Retrieved 17 July 2011. ^ "News – SBY: Indonesia Will Be in the Top 10". Embassyofindonesia.org. 13 June 2011. Retrieved 17 July 2011. ^ "RI 10th-largest economy: WB". The Jakarta Post. 5 May 2014. ^ "World Bank: Indonesia World’s 10th Largest Economy". Jakarta Globe. 4 May 2014. ^ "Indonesia Economy Profile 2011". Indexmundi.com. Retrieved 10 April 2011. ^ "Indonesia — Agriculture". Countrystudies.us. Retrieved 10 April 2011. ^ "Clearinghouse Countries: Indonesia". Childpolicyintl.org. Retrieved 10 April 2011. ^ Muhammad Hasanudin (5 September 2013). "Devisa Pariwisata 2013 Ditargetkan 10 Miliar Dollar AS" (in Indonesian). Jakarta: Kompas.com. Retrieved 24 December 2013. ^ Following a slowing of growth in the 1980s, due to over regulation and dependence on declining oil prices, growth slowed to an average of 4.3% per annum between 1981 and 1988. A range of economic reforms were introduced in the late 1980s. Reforms included a managed devaluation of the rupiah to improve export competitiveness, and de-regulation of the financial sector (Schwarz, pp. 52–57). ^ "Indonesia: Country Brief". Indonesia: Key Development Data & Statistics. ^ "Historical Exchange Rates". OANDA. 7 January 2010. Retrieved 28 April 2010. ^ "World Bank data". Retrieved 29 April 2014. ^ "Policy research". Transparency International. ^ "2010 Corruption Perceptions Index". Transparency International. 15 December 2010. Retrieved 10 April 2011. ^ "Report for Selected Countries and Subjects". IMF. 14 September 2006. Retrieved 10 April 2011. ^ "Monetary Policy Report Quarter IV / 2010 – Central Bank of Republic of Indonesia". Bi.go.id. 3 December 2010. Retrieved 10 April 2011. ^ "Indonesia's economy continues to surprise". East Asia Forum. 25 September 2010. Retrieved 10 April 2011. ^ "IMF Survey: Indonesia's Choice of Policy Mix Critical to Ongoing Growth". IMF. 28 July 2009. Retrieved 10 April 2011. ^ "Indonesian Economy Grows at Top Clip Since '90s". 7 February 2012. ^ "Fitch Upgrades Indonesia's Rating to Investment Grade". 15 December 2011. ^ a b "Census 2010"Central Bureau of Statistics: (in Bahasa Indonesia). Badan Pusat Statistik. Retrieved 17 January 2011. ^ Widjojo Nitisastro (2006). "Population Trends in Indonesia". Equinox Publishing. p. 268. ^ "An Overview of Indonesia". Living in Indonesia, A Site for Expatriates. Expat Web Site Association. Retrieved 5 October 2006. ^ Merdekawaty, E. (6 July 2006). Bahasa Indonesia" and languages of Indonesia""" (PDF). UNIBZ – Introduction to Linguistics. Free University of Bozen. Retrieved 17 July 2006. ^ Dawson, B.; Gillow, J. (1994). The Traditional Architecture of Indonesia. London: Thames and Hudson Ltd. p. 7. ^ Kingsbury, Damien (2003). Autonomy and Disintegration in Indonesia. Routledge. p. 131. ^ "Kalimantan The Conflict". Program on Humanitarian Policy and Conflict Research. Conflict Prevention Initiative, Harvard University. Archived from the original on 12 December 2009. Retrieved 7 January 2007. ^ Johnston notes that less than 1% of the country's 210 million inhabitants described themselves as ethnic Chinese. Many sociologists regard this as a serious underestimate: they believe that somewhere between six million and seven million people of Chinese descent are now living in Indonesia. The Republic of China (Taiwan)'s Overseas Compatriot Affairs Commission gives a figure of 7,776,000, including 207,000 of Taiwan origin; see Statistical Yearbook, Taipai: Overseas Compatriot Affairs Commission, 2007, pp. 11–13, ISSN 1024-4374. Retrieved 30 September 2010. ^ Murray L Weidenbaum (1 January 1996). The Bamboo Network: How Expatriate Chinese Entrepreneurs are Creating a New Economic Superpower in Asia. Martin Kessler Books, Free Press. pp. 4–8. ^ M. F. Swasono (1997). "Indigenous Cultures in the Development of Indonesia". Integration of endogenous cultural dimension into development. Indira Gandhi National Centre for the Arts, New Delhi. Retrieved 17 September 2006. ^ F.H. Winarta (August 2004). "Bhinneka Tunggal Ika Belum Menjadi Kenyataan Menjelang HUT Kemerdekaan RI Ke-59" (in Indonesian). Komisi Hukum Nasional Republik Indonesia (National Law Commission, Republic of Indonesia), Jakarta. ^ "Ethnologue report for Indonesia (Papua)". Ethnologue.com. Retrieved 28 April 2010. ^ "The 1945 Constitution of the Republic of Indonesia". US-ASEAN. Archived from the original on 9 January 2006. Retrieved 2 October 2006. ^ Yang, Heriyanto (August 2005). "The History and Legal Position of Confucianism in Post Independence Indonesia" (PDF). Religion 10 (1): 8. Retrieved 2 October 2006. ^ Sunni and Shia Muslims. pewforum.org. 27 January 2011. "International Religious Freedom Report 2008". US Department of State. Retrieved March 31, 2014. ^ "RI Sunni-Shia Council established". The Jakarta Post. 21 May 2011. Retrieved 17 July 2011. ^ Oey, Eric (1997). "Bali" (3rd ed.). Singapore: Periplus Editions. ^ "Indonesia – Buddhism". U.S. Library of Congress. Retrieved 15 October 2006. ^ "Indonesia – Islam". U.S. Library of Congress. Retrieved 15 October 2006. ^ "1500 to 1670: Great Kings and Trade Empires". Sejarah Indonesia. Retrieved 25 April 2007. ^ Goh, Robbie B.H. (2005). Christianity in Southeast Asia. Institute of Southeast Asian Studies. p. 80. ^ Magnis-Suseno, F. 1981, Javanese Ethics and World-View: The Javanese Idea of the Good Life, PT Gramedia Pustaka Utama, Jakarta, 1997, pp.15–18, ISBN 979-605-406-X; "Indonesia Annual International Religious Freedom Report 2003" (Press release). Jakarta, Indonesia: Bureau of Democracy, Human Rights and Labor, Embassy of the United States. 18 December 2003. Retrieved 25 April 2007. ^ "RI kicks off 12-year compulsory education program". Jakarta Post. 26 June 2013. Retrieved 22 May 2014. ^ "Awakening Indonesia’s Golden Generation: Extending Compulsory Education from 9 to 12 Years". The World Bank-blog. 3 July 2013. Retrieved 22 May 2014. ^ Library of Congress (2011). "Indonesia: a country study". Federal Research Division. Retrieved 22 May 2014. ^ "Data on Indonesia". World Bank. Retrieved 22 May 2014. ^ a b Lewis, M. Paul (2009). "Ethnologue: Languages of the World, Sixteenth edition.". SIL International. Retrieved 2009-11-17. ^ Witton, Patrick (2003). Indonesia. Melbourne: Lonely Planet. p. 103. ^ a b Kristianto, JB (2 July 2005). "Sepuluh Tahun Terakhir Perfilman Indonesia" (in Indonesian). Kompas. Archived from the original on 13 January 2008. Retrieved 2 August 2010. ^ "Kondisi Perfilman di Indonesia (The State of The Film Industry in Indonesia)". Panton (in Bahasa Indonesia). Archived from the original on 21 December 1999. Retrieved 2 August 2010. ^ Czermak, Karen; Philippe DeLanghe; Wei Weng. "Preserving Intangible Cultural Heritage in Indonesia" (PDF). SIL International. Retrieved 4 July 2007. ^ Shannon L., Smith; Lloyd Grayson J. (2001). Indonesia Today: Challenges of History. Melbourne, Australia: Singapore : Institute of Southeast Asian Studies. ^ "Internet World Stats". Asia Internet Usage, Population Statistics and Information. Miniwatts Marketing Group. 2006. Retrieved 13 August 2007. ^ "Asia Internet Usage Stats and Population Statistics". Internetworldstats.com. Retrieved 10 April 2011. ^ "Phoning from home". Globeasia.com. 30 August 2010. Retrieved 10 April 2011. Friend, T. (2003). Indonesian Destinies. Harvard University Press. Ricklefs, M. C. (1991). A History of Modern Indonesia since c.1300, Second Edition. MacMillan. Schwarz, A. (1994). A Nation in Waiting: Indonesia in the 1990s. Westview Press. Taylor, Jean Gelman (2003). Indonesia: Peoples and Histories. New Haven and London: Yale University Press. Vickers, Adrian (2005). A History of Modern Indonesia. Cambridge University Press.